Do you have an interest in early Tonka Toy trucks? Do you have difficulty identifying vintage Tonka trucks? Maybe you've had this experience. You find a super looking antique Tonka truck at your favorite antique store or flea market and the well intentioned person guarding your potential prize informs you that the vintage Tonka truck you are drooling over was definitely manufactured in 1958, when you saw the exact same Tonka truck on the eBay auction website listed as a 1962? Who's right? And possibly more importantly, who's wrong? Before you whoop out your trusty credit card or lay down those hard earned greenbacks, you need to know. It's time for you to become a well informed Tonka truck enthusiast. Featured within the confines of Neat Old Toys, you will find extensive information on early Tonka trucks, manufactured from 1955 through the mid 1970's. Tonka collector or enthusiast, you want to be able to make well informed, knowledgeable decisions the next time you stumble across an old Tonka truck at a garage sale, flea market or on-line auction site. This is the website you've been looking for. Want to take a shot at restoring an early Tonka pickup back to its original glory. It's a personal choice to be sure, whether your prized Tonka truck should be kept in its as found condition or to add a little color to an old Tonka that may have seen its share of haulin' the goods over the years. Guess the bottom line here is if you're interested in restoration, there's a section just for you. In 1964, the Mighty Tonka Dump paved the way for a whole new series. If you like Mighty Dumps, they are featured here. If you want to review the entire Mighty Tonka series from 1964 to 1997, www.MIGHTYTONKA.com is where you need to go after you complete your visit here. This companion website went live on January 10, 2012. New on June 30, 2011, companion website www.TONKAGASTURBINE.com fills an information void on the futuristic Gas Turbine trucks that were new in 1965 as part of the "Regular" series. And yet another companion website went live in September 2013 featuring private label Tonka trucks, custom Tonka trucks and DeSalle collectibles that are based on Tonka trucks from the 1956, 1957 and 1958 time-frame.www.TONKATOYSTRUCKS.com is where you need to be. They're the next best thing to the Tonka dealer catalogs; Tonka Look Books offer a small in scale year by year reference. 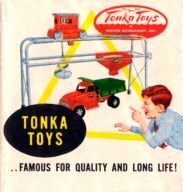 Tonka Look Books were included with the toy from 1953 to 1975 in an effort to entice another Tonka toy purchase. A 1968 Canadian and a 1964 New Zealand Look Book and a 1983 United Kingdom Dealer Catalog add an international flavor to Tonka's domestic line up. And finally, if you have a question related to Tonka Toys in general or you just want to say howdy, there's an email link in the menu. Being the shy type, I've always been slow to toot my own horn, if at all. But it's time to step up to the podium and do a little old fashioned crowing. Neat Old Toys has been recognized and referenced as an "INTERNET RESOURCE" since 2004 by Maloney's Antiques and Collectibles Resource Directory, online at www.MALONEYSDIRECTORY.com. And in 2005, an entire article on Tonka Toys as collectibles; based on information from Neat Old Toys, was published in the Great Lakes Trader, a monthly publication for antiques, fine arts and collectibles serving Michigan and the upper midwest. Thank you very much! This website created and owned by G.T. Kitchen. © 2000-2018. All rights reserved. All content (text & images) are the property of the website owner unless otherwise noted. Tonka and the Tonka logo are registered trademarks of Hasbro, Inc. © 2018 All other trademarks found on this website are used exclusively for identification purposes only.